I tried to draw the characters as I picture them, I got close but they're not exactly right.... well, someday I hope to portray them as I imagine them... I have to keep drawing and trying, right? - Alice. She's the one who came out almost exactly as I picture her. - Their hairs. I love to draw hair and I can't find a style I like... I always draw hair in different ways. These don't look like REAL hairs, but I like them all the same. The only one I'm not entirely happy with is Emmett's. - Bella's pointy chin. Too pointy. - Rosalie's expression. I couldn't draw it as I wanted. - Their eyes... Next time I should draw in a way that you can see their colour. I'm really happy you liked it...! Yeah, I know Emmett is supposed to be quite large (Bella's dad described him so). I hope I got him right. And Dr. Cullen's name is Carlisle :P What a difficult name. I can write it but I can't pronounce. I think you're right about Edward... He's only carefree when he's alone with Bella. LOL and I don't think she's always so depressed... but I'll try to tame her happiness a little... give her a calm smile, or something. They look awesome! I always kind of imagine Edward as the same height as the doctor (having a memory blank on his name!!!) and definitely taller than Jasper, but I think you've got Emmett pegged as this huge, hulking bear of a guy that would tower over everyone else. Alice is adorable! Overall, I really really like how you've depicted them. They are very close to how I see them in my mind also. Great job! I need to read the Twilight books. They're on my list. ;) I personally like the picture very much, but I haven't got any preconceptions about what anyone should look like. Now I reallly want to read them so I can see who you're talking about. You're such a gifted artist. Which reminds me, could you email me your regular mailing address again? You definitely should! :D And I do hope you'll like the books. They're really addictive. *off to send you my mailing address* Sorry it took me so long! I love this drawing so much, it's beautiful! 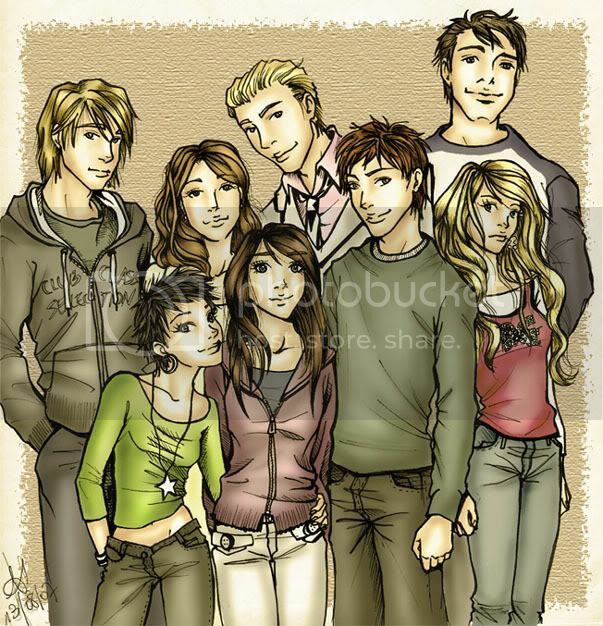 You drew most of the characters similar to how I imagine them to be (though I suppose Emmett's hair should be curlier). The only that isn't exactly how I picture him is Edward, but I think he's the hardest to get anyway. I honestly don't even know if I have a concrete image of Edward in my head, he's too pretty. I do imagine him dressier, though, maybe a shirt with a collar. Btw, Emmett is the tallest, I just forgot how tall. You should definitely check out the Twilight Lexicon, it tells you everything. Emmett's hair is curly? 0.0 I didn't know. LOL! I imagine him dressier too! I don't know why I had him looking more casual. I love it, Amanda! I especially love how Alice has sneaked her hand around Bella's waist and has a sneaky little smile on her face. Emmett is perfect. I agree that Bella's chin is a bit pointy, and Edward isn't quite how imagined him. Thank you! :D I'm glad you noticed the little details of Alice's hand... and I agree with you that Edward isn't quite right. I think his built is more like I imagine than his face... but for me, Edward's face is the most difficult to draw... how can I draw someone so perfect?? It doesn't help that I don't have a clear picture of him in my head. Mis favoritos son Rosalie y Alice. Rosalie se ve petulante, justo como la imagino. Alice es pequena, alegre y con rasgos elfinos, justo como la imaghinaba. Edward tambien me gusta, pero por alguna razon lo imagino con el menton un poquito mas ancho y el pelo un poquitin mas largo (pero solo un poco). Precisamente es por eso que no me gusta Gaspard Uliel, por su menton (y la cicatriz). Que bien! :D Me pone feliz q te guste mi dibujo..! Thank you! ;) And you can be sure that time is coming. my only problem is with Bella's head. She basically has no forehead and her hair is sitting almost on top of her eyes. Just look at the other females you drew and you'll see the difference. Wow! I love this. All of them look very close to how I imagine them... I don't think Emmett is too tall, since he's supposed to be gigantic anyway. But Jasper is a little tall, especially if you compare him to Alice. She's so tiny. But she's cute. :) I also like Esme and Carlisle--Esme has that soft, motherly expression that's so perfect for her, and Carlisle's got the slicked-back hair and a sort of professional doctor look. Overall, awesome job! Thanks so much! I'm happy you liked my portrayal of the characters :) And I definitely should look into the characters's heights more. these are exactly how I pictured them! I am going to start seeing them as these cartoons everytime i read the book now. I really like how you can tell that edward is the youngest by how boyish he still looks. I keep stareing it, expecting them to start talking to me or something! XD Please come out with more!!! Thank you so very much! :D I'm really happy that you like my art enough to start imagining the characters as I drew them, it really means a lot. I'll be sure to come out with more. Thank you very much! :D I'm happy you liked the picture!